Located in the newly and high luxurious developed resorts destination of Tala Bay, only 20 KM south of King Hussein International Airport and 15 KM south of the city of Aqaba. The Hotel is the cornerstone of its most famous of bays, offering breathtaking views of the golden mountains with collection of restaurants and bars, modern rooms and leisure facilities. Marina Plaza is a unique 4-star hotel located along the shores of the Red Sea. 15 km south of the city of Aqaba. Standing boldly at the entrance of Tala Bay, Jordan’s premier luxury destination. 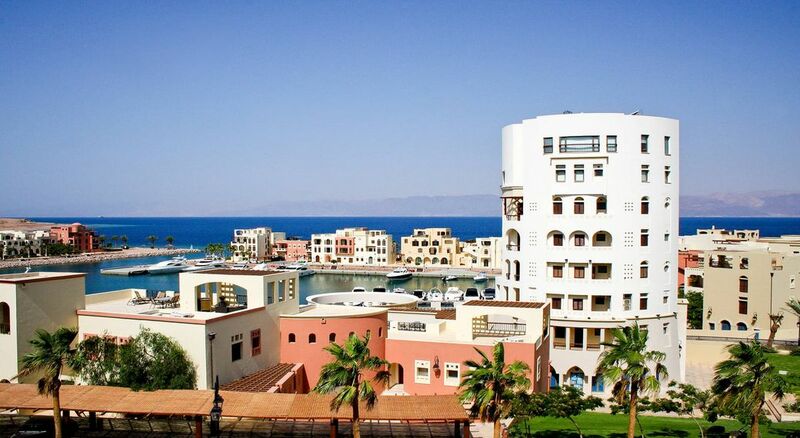 The Hotel boasts stunning views of the nearby marina and mountains of Egypt rising from across the Gulf of Aqaba. Free shuttle bus from the hotel to Aqaba city and vice versa. 260 guest rooms including 8 suites which can be booked as a Junior or Senior Suite. Also, we provide the option of 78 interconnecting or family rooms and 28 non-smoking rooms. One room provide wheelchair access for guests with mobility requirements. All hotel rooms have modern amenities and overlook the beautiful Tala Bay marina, the central swimming pool or the stunning Aqaba mountains. “Petra” Conference Room, 88 m². “Wadi Rum” Board Room, 40 m². The main restaurant at Marina Plaza serves both international and regional cuisine in an enticing buffet followed by the sweet temptations of the hotel’s pastry chef. You can also choose to upgrade to an a la carte dinner. The candlelight ambience and selective wine menu will enrich your perfect evening. A wide selection of cigars is offered on the terrace. Located directly at the hotel swimming pool, the bar offers refreshing drinks and a diversified selection of snacks, ice cream and cakes. Be sure to take advantage of Marina Plaza Happy Hours and our other promotions at the Sea Horse Bar. Corner bar is the perfect place for friendly gatherings, watching the sport games and playing chess. Located near the lobby, Corner Bar features a LCD screen and a selection of board games, cigars collection and background music. Enjoy our cocktails, wines, spirits, soft drinks or coffee with fresh pastries. Relax on low seating and traditional rugs as you enjoy regional argyle, tea, coffee and live oriental music. Traditional Jordanian Zarb (baked lamb) can be specially prepared by our chefs for groups of at least 25 persons.